Overwhelming Response to AED Superstore Scholarship Opportunity! Our selection committee has read through over a thousand essays and watched many video submissions for our latest scholarship offering. We love the fact so many young adults are learning more about sudden cardiac arrest and how to respond in the event of an SCA emergency. Many of our applicants seem sincerely motivated to go out and spread the word. We hope they do, and we wish we could help all of them with their higher education. It was difficult narrowing down the field, but after much deliberation, we are pleased to announce our winner is Omar Vasquez of Aliso Viejo, CA who is planning to attend Boston University in the fall. “I wish more people knew SCA affects roughly 16 people under the age of 18 every day”. Most people have the conception that heart conditions begin in the latter stages of life, however, the reality is much different as even athletic young individuals can fall victim to sudden cardiac arrest (SCA). Many people believe that these are rare cases, unfortunately, the only rare outcome is surviving SCA as access to Automatic External Defibrillators (AEDs) is limited and paramedic response times are simply not quick enough. With every minute that passes, there is a ten percent decrease in the odds of survival and with roughly 300,000 people experiencing SCA every year it is necessary that AEDs in schools be mandated by law. Efforts should be made to educate individuals on how to perform CPR and use an AED because that could be the difference between life and death. It may be difficult to imagine a scenario where an individual under the age of eighteen would suffer SCA, yet I fell victim to SCA when I was seventeen years old while practicing for track and field. I am one of the lucky ones that survived SCA and have had my life changed ever since. I would not be here today as the paramedics did not arrive until ten minutes later, if not for the quick reactions of my coaches starting CPR and of local firefighters using an AED on me. After this incident, I was shocked to learn that every three days a young competitive athlete will die from sudden cardiac arrest. I was devastated because not everyone that suffers SCA receives a second chance. I made a promise that day to make a difference by telling my story. I was lucky enough to become one of the first members of Saving Hearts of California Kids, otherwise known as SHOCKS and through this organization I have been spreading awareness at my current school and community. Our mission is to educate about SCA, and ultimately fundraise and donate AEDs to schools in our local community. We recently donated our first AED to Washington Elementary in Berkeley, California. I have also taught a DeCal which is a student-led class at UC Berkeley on the topic of SCA as well as policy and health. I ensure each student in the class is taught how to perform CPR and how to use an AED. I also invite professionals in the field to share knowledge and ways we can make a difference in our community. As the campus officer for SHOCKS, I led the education efforts on campus and organizing events such as AED scavenger hunts. I am also an SCA ambassador for the Racing Hearts organization. I will continue to use my personal experience as an example of why it is necessary to have access to AEDs and hopefully spark change in public policy but also in awareness and education of the general population. Omar is a recent graduate of the University of California, Berkeley with a degree in Psychology. He is now off to his next adventure as he will be pursuing a master’s degree in Counseling with a specialization in Sport Psychology at Boston University this upcoming Fall 2017. Although Omar is moving to a new home, he will continue to share his own personal story of being a sudden cardiac arrest (SCA) survivor to educate and promote awareness about SCA. In addition, he also will continue to work with the Saving Hearts of California Kids (SHOCKS) organization to ensure that all schools in California have access to AEDs. Nonetheless, he has no plans for stopping there, rather Omar hopes to also earn a Ph.D. in Counseling Psychology. His goal is to become a sport psychologist and work with athletes and sport organizations. Omar’s interest in the field of sport psychology is to help athletes that suffer traumatic injuries and aid in the mental recovery of injury and or athletic identity. Omar developed his interests in sport psychology from a young age as he was a competitive athlete. He participated in basketball, soccer, cross-country, and track. His passion for sports and psychology led to his decision to pursue the field of sport psychology. Aside from sports, Omar enjoys being outdoors and traveling. Currently, his favorite travel destination is Bologna, Italy. 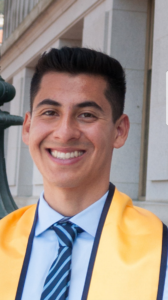 We congratulate Omar and we hope these continued scholarship opportunities spur young adults to find ways to educate their communities about sudden cardiac arrest and the importance of AEDs. We will continue to do our part and keep working to spread the word – any help you can give us is greatly appreciated! Let’s save more lives together! This is a great example leadership and I applaud Omar for taking an active role in his community with regard to better understanding SCA and what can be to increase survival rates. It is great to see AED Superstore playing a prominent role across the country in the education of this medical condition and more importantly equipping various entities to treat patients.